DETROIT — Jane García got tired of catching prostitutes turning tricks in the alley next to the nonprofit agency where she worked. Calling the police proved pointless, she said. An arrest meant the women would return 24 hours later, luring men from the saloon across the street called The Carnival Bar. So García and others at Latin Americans for Social & Economic Development came up with a solution: They bought the building that housed the bar, shut it down, found housing for the squatters who lived in the decrepit apartments upstairs, then renovated the whole building. This is community development in action, southwest Detroit style. It’s this kind of spirit — residents, nonprofits and immigrant entrepreneurs banding together to oust slumlords, rehab ramshackle buildings and revitalize the business district — that’s helped the section of the city prosper at a time when other enclaves continue to crumble. In the face of such growth, some wonder why Mayor Kwame Kilpatrick didn’t choose this area as one of the six slated to share $125 million in city aid as part of his Next Detroit Neighborhood Initiative. Residents say they’ve learned to work around the lack of heavy city investment and in the face of a sour economy. Their ability to develop the community is evidenced in the fact that business owners pooled $300,000 last year to clean walkways, adorn streets with potted plants and buy surveillance cameras. It’s demonstrated in the efforts of residents who’ve gone to court to shutter crack houses, then spent years renovating those homes to give them new life. It’s seen in the tenacity of immigrant entrepreneurs who started businesses with money borrowed from family members. His spokesman, Matt Allen, calls the area a “gem of our city.” He uses words like “synergy” and “dynamism” to describe it, yet recognizes it could use more money but choices had to be made. Allen said the neighborhood initiative may be expanded. “These focused endeavors are a starting point,” he said. Those who work at nonprofit agencies acknowledge the difference the city has made by providing money to the community, mostly federal grants earmarked for residential and commercial rehabilitation. That public money helped Bagley Housing build 85 homes and Southwest Housing rehab 300 affordable housing units over the past 10 years. Marja Winters, director of the city’s Office of Neighborhood Commercial Revitalization, said those dollars — which she says runs in the hundreds of thousands each year — are stretched in the southwest neighborhood because there is a group of nonprofits with a common vision. The depressed economy has chipped away at gains, though. While storefronts went from vacant to full during the past 10 years, the number of businesses peaked in 2005, with 1,926 counted by the Southwest Detroit Business Association. The number now stands at 1,719. The association believes the number is on the upswing. 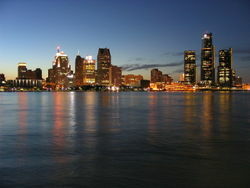 In 1999, the neighborhood’s household median income was $25,000, compared to $29,500 for Detroit, according to the Census. It is the only neighborhood in the city that has seen population growth over the past decade, according to the 2000 Census. Since then, demographers say the area has continued to grow, although there are no firm figures available. Some say the time is ripe for the city to invest heavily in the area bounded by Tireman, Grand River, the Lodge Freeway and the river. Paul Fontaine, a senior urban designer for the private city planning firm JJR, said he believes investment could yield huge benefits for the city as a whole, because the area draws people from Canada and the suburbs who spend their money there. “For a plan and vision to work, people need to see immediate success,” he said. It’s an area that could have a reverberating effect on neighboring areas, he said. Urban planners say it will still happen but at a slower pace without investment. Lydia Gutiérrez, owner of Hacienda Mexican Foods, started her tortilla factory on West Vernor in 1994 with four employees. Now she has more than 100. It grew because for years she and her husband, who is now deceased, worked 70-hour weeks and drew minimal salaries. It was the only way to pay workers well enough so they wouldn’t leave. And about half of them own homes in the area. That’s why many of them gladly gave to an association fund that last year paid for 15 surveillance cameras in the business district. It helps that there are many nonprofits committed to developing the area. Regina Strong, executive director of Community Development Advocates of Detroit, said the area has a larger concentration of community development corporations — seven — than anywhere else in the city. And then there are residents like Robert Andersen and his wife, Raquel García Andersen, who bought a three-story brick house four years ago. That’s not the case, he said. His neighbors are a mélange of yuppies, hipsters, young, old, those who are well-off and many who are struggling. The blighted spots don’t bother him. Every year he sees fewer. The couple is expecting a child in September. Do they plan to move when the baby arrives? You can reach Cindy Rodríguez at (313) 222-2311 or cindy.rodriguez@detnews.com. ~ by Keith A. Owens on May 23, 2007.